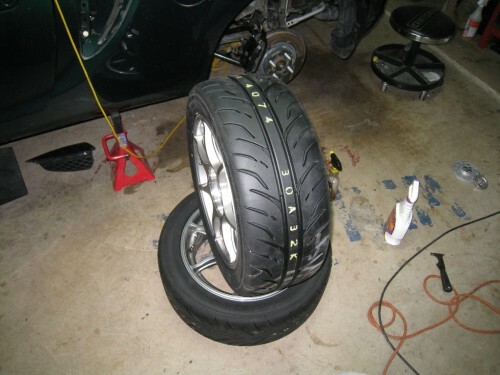 The Toyo R1Rs on the Spyder, well at least the rears, were completely bald in about 2,000 miles of highway only driving. I intend to get a track-spec alignment before putting on any real miles. I’m not sure if the local Firestone is getting it as dialed in as needed. Another other problem is that the R1Rs don’t give any audible feedback, and with 310+ hp at the rather small 225 rears, there was a chance they were spinning. I still doubt it was just from burning rubber. 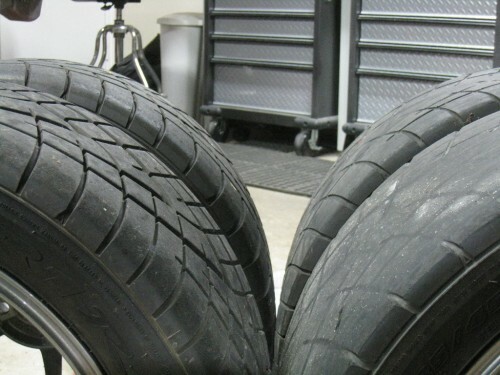 Front Toyo R1Rs on the left, rear on the right. I replaced the R1Rs with the newly released Dunlop Direzza ZIIs (Z 2), the replacement for the Star Specs. They should have similar, if not better performance. Another benefit, they were much less expensive than the Toyos. There aren’t many tires available in the rear size (225/45R16) that I run, so I was pleased to see another option out there. You are here: Home \\ Articles \\ How To's \\ T-stat Soup?